Did you know that the attribute is a characteristic of Japanese culture than the tea ceremony and the art of the geisha? This hot springs, which are must-see destination for any traveler visiting.Hot springs – a great relaxing holiday in a clean and healing mineral water, which is akin to meditation. In addition, the week-long visit to the hot spring is able to create a miracle, to get rid of many diseases and ailments. No wonder the Japanese are considered to be the healthiest nation in the world other than longevity – because they periodically enjoy a dip in the hot springs or onsen. Whatever kind of tour in Japan you choose, be sure to include in his visit to the hot springs, and the more days you spend on them – the better. The geological formation of the Japanese archipelago are such that all regions of the country rich in hot springs and almost any town or resort is able to offer you a visit to an onsen . In total, Japan has more than 26 thousand hot springs, and the Japanese are continually creating new ones. 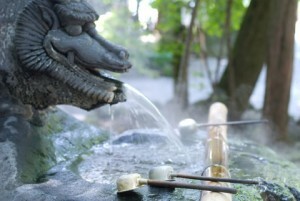 Modern drilling technology can create a Japanese hot spring in almost every region of the country. 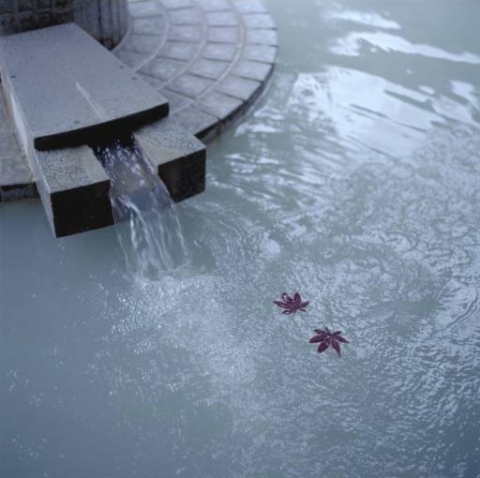 Hot springs have sacred significance for the inhabitants of the Japanese archipelago. This Onsen has long been considered the best means of treatment and healing of wounds received in battle, the history of the many hot springs associated with the life of famous monks, who in ancient times lived as hermits to retire and near some onsen. Bathing in a hot spring for all Japanese – are not just a pastime, and has nothing to do with a simple flushing dirt, in contrast to the Russian bath or Turkish sauna. It is a ritual that combines the enjoyment of peace of mind and body, finding harmony and admiration of the surrounding landscapes, if the hot spring is located in the open air. All visitors should be aware that there are certain rules of visiting the hot springs, which can not violate. The procedure for visiting the hot springs may differ slightly depending on the region, as well as depending on the source type – closed or located in the open air. Often, before a dip in the water source, it is necessary to wash off the so-called “first” dirt in special shower. You can then dive into an unusually hot water smelling of sulfur. In many hotels when visiting hot springs offer a light cotton kimono – yukata. Light natural fabric perfectly calms the skin after a hot thermal bath.In the cooler period over the yukata robe to be put on the haori. In the pool itself should behave respectfully and be quiet, do not talk too loud, do not splash and do not make any sudden movements. It should sit in hot water, focusing on your inner world. Hot Springs in Japan vary the composition of water, which may be hydrogen sulphide, hydrochloric acid, carbonic acid or glandular. Accordingly, a different type of water has its own therapeutic effect. The most common diseases that treats water hot springs, are skin diseases, female reproductive system diseases, diabetes and vascular problems. Everyone, without exception, the hot springs to help restore a weakened immune system, to get rid from frequent colds and increase overall body tone. Choosing the kind of hot spring, if you get a ticket for therapeutic purposes, it should be on the recommendation of a specialist. 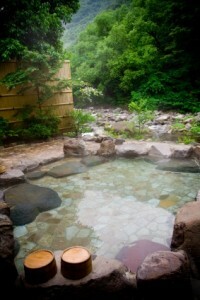 Onsen is famous not only medical, but cosmetic effect. Japanese women are much later than Europe, show the appearance of first wrinkles, and a young beautiful skin they owe periodic bathing in hot springs. Water sources soften the skin, cleanse the pores, smooth out wrinkles appeared. The most common variant of visiting the hot springs – a day or two. This is enough to enjoy the charm of staying in the pool of hot, because the thermal baths can be taken several times a day.But in such a short time, the therapeutic effect of the procedures can not be shown. 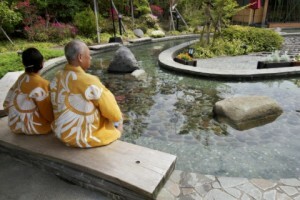 Special treatment courses visit the hot springs include a week-long stay, and it is recommended to spend at the resort with hot springs at least two weeks for the treatment of serious illnesses. Modern industry offers a holiday in Japan to combine relaxation at the hot springs with other entertainment. You can spend the day on interesting excursions or on the ski slopes, and in the evening relax in the hot pool under the stars. Resorts offering holiday at the hot springs, can boast of fine cuisine, beautiful sea and mountain views, high level of service and availability of rich excursion program. Noboribetsu onsen – is located in Hokkaido, a region known for the abundance of hot springs.The resort is located in the national park and plunging into the water source, you can admire the beautiful mountain scenery. The resort offers a variety of baths, from small hidden to spacious outdoor pools. Takaragava onsen – is located in the east of Japan, Kanto city. This resort is located close to the capital and enjoys a special love for travelers, because the mineral water here has the most favorable composition and temperature. Along with a dip in the healing waters of the resort can be found with the exposition, located in the territory. 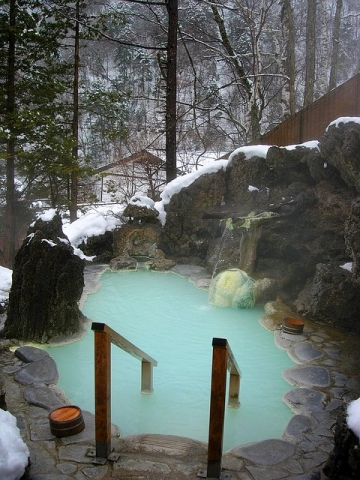 Kusatsu Onsen – located in Gunma Prefecture. Beautiful resort on the slopes of an active volcano, which offers tourists to see the crystal-clear mountain lake and enjoy the rich mineral composition of hot tubs and swimming pools. 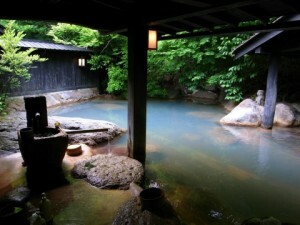 Hitio no Mori onsen – is located on the island of Kyushu. Characterized in that a hot bath can be here in seclusion, as the resort offers a host of small private onsen, which for a fee received in full your disposal for an hour. The resort is designed in traditional style, all interiors are traditional and simple.